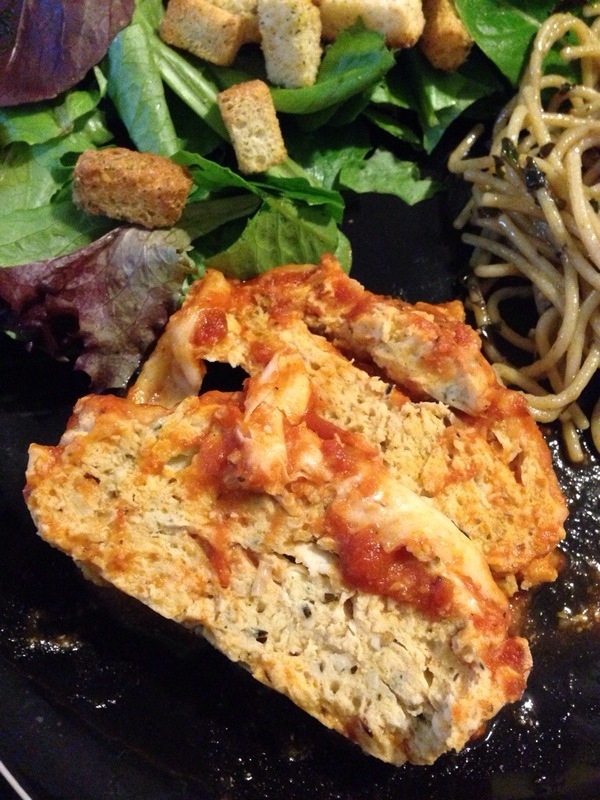 Chicken parmesan has been one of my most favorite foods for as long as I can remember. 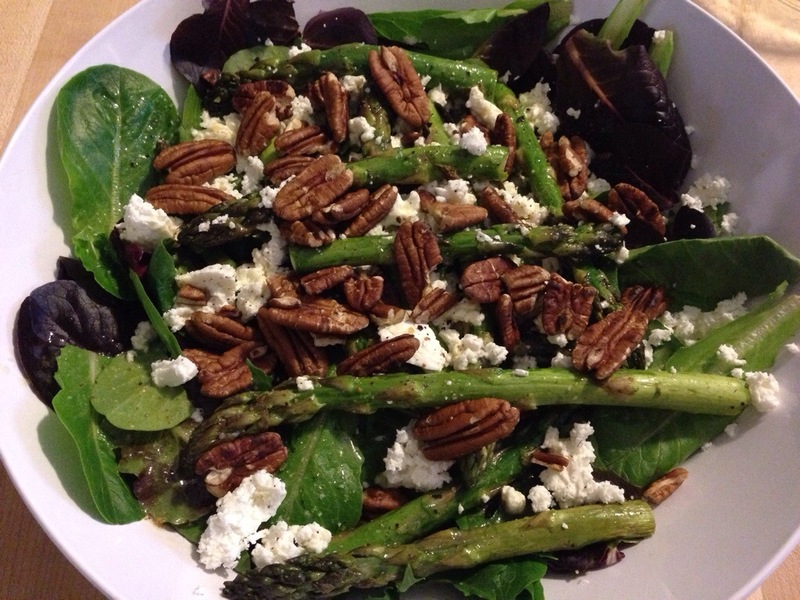 Serve it with a salad, some spaghetti, and maybe some garlic bread or breadsticks…yum. Then again, I’m also Italian. How could I not like this dish? 😉 It’s another one of those comfort foods that I hold near and dear to my heart. And, with the weather as cold as it’s been (I saw -26 on my thermometer on the way to work. WTF), you all know that I just can’t get enough of comfort food. But, I’m away from my home anywhere from 8 to 15 hours a day – depending on what band event is going on – and sadly, I don’t have as much time as I’d like to really put some love into weeknight cooking. That’s where this recipe comes in. It’s one where you can make it ahead of time on a lazy Sunday, or mix up in 10 minutes. You can fix it, and forget about it for a little while – but still tastes good (unlike some of the meals that my crockpot has been overcooking lately). I believe it put it all together, threw it in the oven, and worked on laundry and grading for a while. adapted from What’s Cookin’ Chicago? Preheat the oven to 350*. Lightly grease loaf pan with cooking spray & set aside. In a large bowl, combine the meat, egg, breadcrumbs, spices (except the parsley), and Parmesan cheese. Mix until combined. Place the mixture into the greased loaf pan & press down to make a loaf. Top the meatloaf with pasta sauce. Bake in the preheated oven for 40 minutes. Remove the meatloaf from the oven and top with the Italian blend cheese and parsley; put back into the oven and bake until the cheese is nice and bubbly. I paired this with a green salad and some spaghetti, mixed up with some garlic scape pesto we had in the freezer – which, may I add, froze really well and was so wonderful to thaw and use in the dead of winter. Our house smelled amazing as this was cooking.bNext time I’m going to make a few batches of this and freeze it, so we have some quick meals for busy nights. Since I have that lovely deep freezer, I have plenty of room! 🙂 The instructions for baking from frozen should be on the original post. ‘Tis the season, everyone. We’ve had a continuous snowfall over the past few days, holiday concerts are abound, and I have yet to really make a dent in our Christmas gift list. The other night we had a few friends over after our town open house (where they close the streets, stores stay open late, the steel drum band plays, and everyone walks around eating, drinking, and being merry). Afterward we had a few friends over and snacked while we played a board game or two. 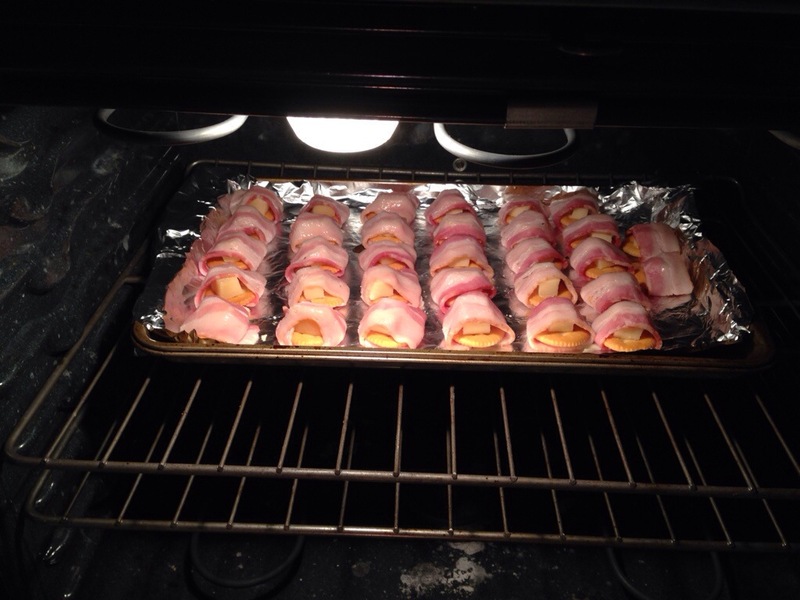 Our appetizers included Bacon Bombs – one of my husband’s most favorite finger foods to make and to eat. And I’ll admit that it’s not very good for your waistline…but they do taste awesome! Preheat your oven to 250*. 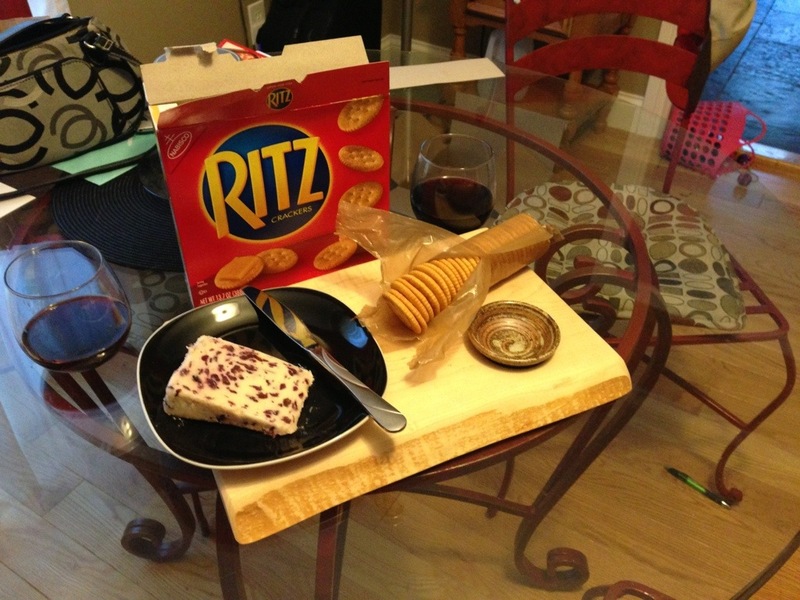 Place a piece of cheese on a Ritz cracker and wrap snugly with a piece of bacon. Place on a broiler pan (so the grease drains). Repeat as necessary. Bake in the oven for two hours, or until the bacon is done. Remove from oven and drain any excess grease on paper towels. Bacon. Cheese. Ritz crackers. Yeah, buddy. I did forget to take a picture of the final product (oops!) so I apologize for the ugly photo of my lower oven. We used Parmesan for these ‘bombs’, as we were having a small gathering and didn’t want to make too many. As you can see by the picture, my husband didn’t use a broiler pan, so our bombs ended up a bit greasier than I would have liked. I am glad, however, that he did use foil so that cleanup wasn’t as obnoxious as it could be (I hate washing pots and pans). 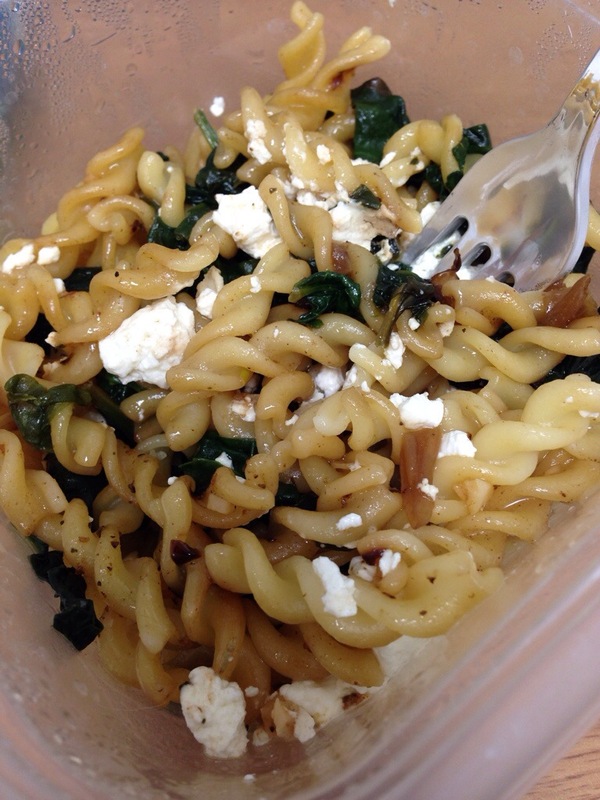 Leftovers were stored in a plastic container, in the fridge, and only lasted 2-3 days. One of the things that I like about this recipe, other than bacon & cheese as ingredients, as that we could put it in the oven and go walk around downtown for a little while. If you’re getting ready for company, you can just set these in the oven, set a timer, and go about preparing other thing and/or cleaning. They’re easy. Not good for you by any means, but easy and delicious! With fall and cooler temperatures comes one big request in our dinner rotation: comfort food. I was raised on Kraft macaroni & cheese, so I don’t mind eating it at all. My husband, though, prefers the real thing 2:1, so I need to make it from scratch every once in a while (in his defense, he will oblige to eat it my way; Kraft macaroni & cheese with hot dogs). Gina over at Skinnytaste does a fantastic job (as I’m sure many of you know) with lightening up recipes & still making them taste good. She truly doesn’t disappoint with this one, either. I used broccoli from my CSA, which really added something fresh to this dish. Being that we want to eat more vegetables, but have our mac ‘n cheese and eat it too…this was a great remedy and compromise. In a large pot, cook the pasta & broccoli together until the pasta is al dente (I love this. It saves you a pot!). Meanwhile, spray a casserole dish with some cooking spray & preheat the oven to 375. In a large skillet, melt the butter. Add the onion & cook on low for about 2 minutes or so. Add the flour & combine with the butter until a nice roux forms and the mixture is a nice gold color. Add the milk and broth, and whisk; turn the heat up to medium-high until it starts to boil. Stir consistently until the sauce becomes nice and thick – but do not let it boil over! Add salt & pepper, then stir & remove from heat. Add the cheese & mix well until the cheese is melted & the mixture is even thicker. Add more salt & pepper if needed. Add the macaroni & broccoli, and mix well. 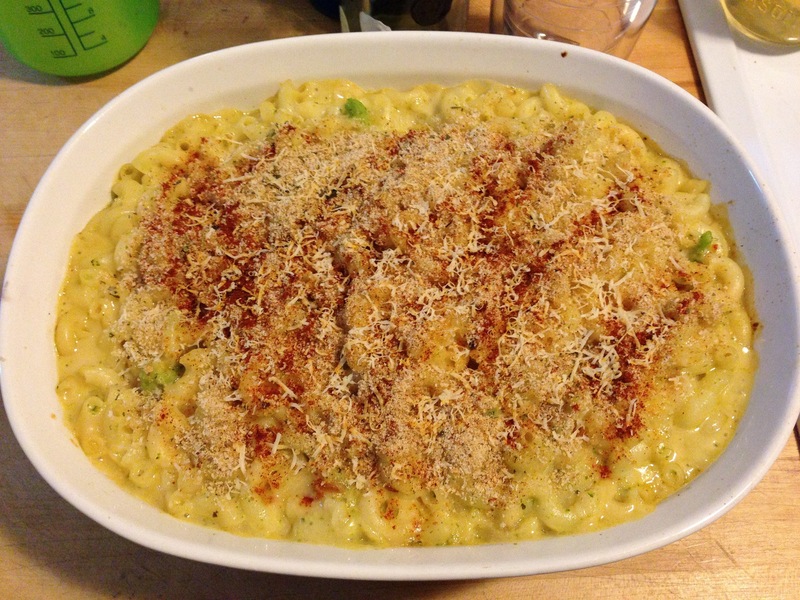 Pour the mac & cheese into the baking dish, and sprinkle parmesan and breadcrumps on top. Then, add a dash of paprika, too. Bake for 20-25 minutes, til the top gets a little golden brown. I really liked out this turned out. I know that I didn’t miss the full-fat version very much; this dish had great flavor and I didn’t feel very guilty about eating it. It’s always nice to feel a little indulgent when you’re trying to watch what you eat – especially when all you want is some comfort food. This is one of those recipes that I had read about on another blog, and just couldn’t get out of my head for weeks. I knew I had to make it! I love cheese, and I love jalapeños…what more could I ask for? I even got to break in the dough hook that I received with my Kitchenaid mixer. Now granted, this isn’t a good bread for making sandwiches. It’s a good bread to eat for a snack, or along with a hot bowl of soup or chili – which we did this evening since it feels like October outside (back to perfect weather tomorrow, though!). I also recommend this bread with just a smear of butter/margarine. But, no matter what the weather or way you eat it, it’s pretty darn good. 1 medium jalapeño, deseeded & chopped fine – make sure to wear gloves if you can! In a large bowl, mix together your flour, salt, and baking soda. Add the butter and mix well (either with your hands or with your dough hook in your mixer) until the butter is broken up and well-distributed in the flour – kind of like ‘grains of sand’. Add the cheese and jalapeño. Add the buttermilk and mix until it combines – try not to overmix it. Divide the dough half and place each half in a loaf pan – or just leave the other half of the dough in the bowl. Smooth out the top and etch a few slits into the top. Bake for 25-30 minute until a nice golden brown. Don’t judge a bread by it’s shape. I’ll admit, my loaf is ugly. Since I only had one loaf pan, I simply let it cool, removed the loaf of bread, sprayed the pan again, and prepared the 2nd loaf; half of which went to our neighbor. The jalapeños in the bread give it some heat every other bite, while the cheddar cheese is also quite pronounced. 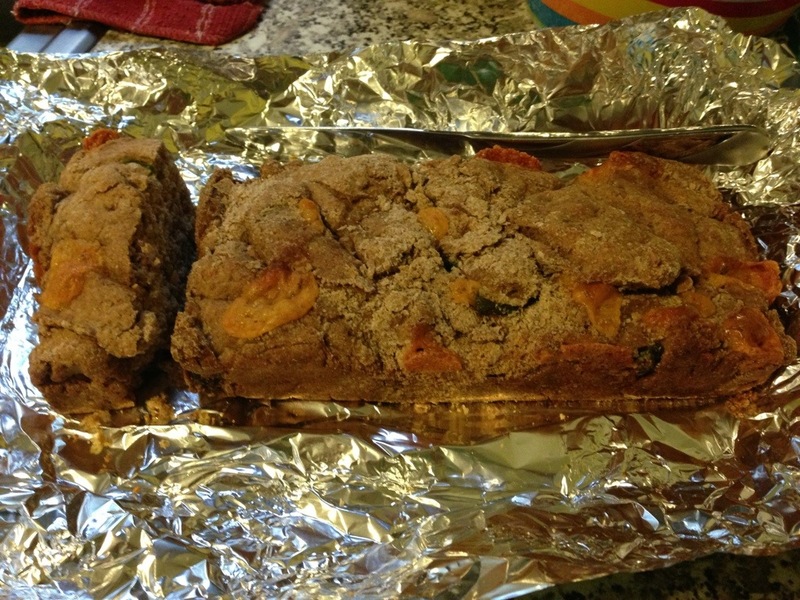 My bread didn’t turn out very ‘pretty’, as I veered from the recipe a bit. I also used whole wheat flour, as that’s what I had on hand. What wacky, wacky weather. Last weekend it felt like fall – thankfully we are back up to perfect summer temperatures; not too hot, not too cold. 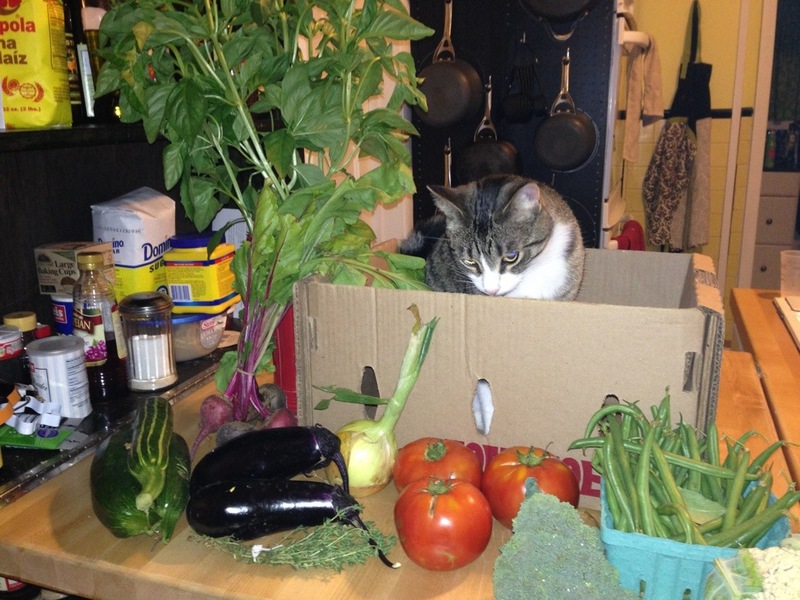 Today will be spent playing ‘catch-up’ with making sure our CSA vegetables are processed for canning or the freezer, or ready to go for this week’s meals. This past week we ended up dining out twice – once because our potluck fell through, and the other because it was our 5-year anniversary. Our tradition for our anniversaries is to stick to the “traditional gift” theme. The traditional gift for the 5-year anniversary (as much of a milestone as it is), is wood. I purchased an oak barrel for my husband – who doesn’t hit at gifts very often, but hinted again and again for a barrel so that he can brew a bourbon beer of some sort.